It's Fall y'all. And it's my favorite. I love the color and the light and the coolness in the air. I love jeans and fleece jackets and the way the earth yields to God's grand design. Hubs and I enjoy hiking and we're excited to explore the many parks and trails around our new home state. 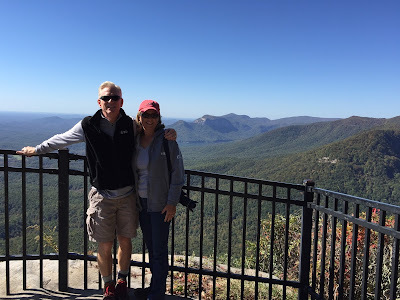 I wrote about our visit to Pretty Place here, and yesterday we headed back up the mountain for a hike to Raven Cliff Falls. I know, more Dramamine, but we do what we must. Plus this weather is sheer perfection. 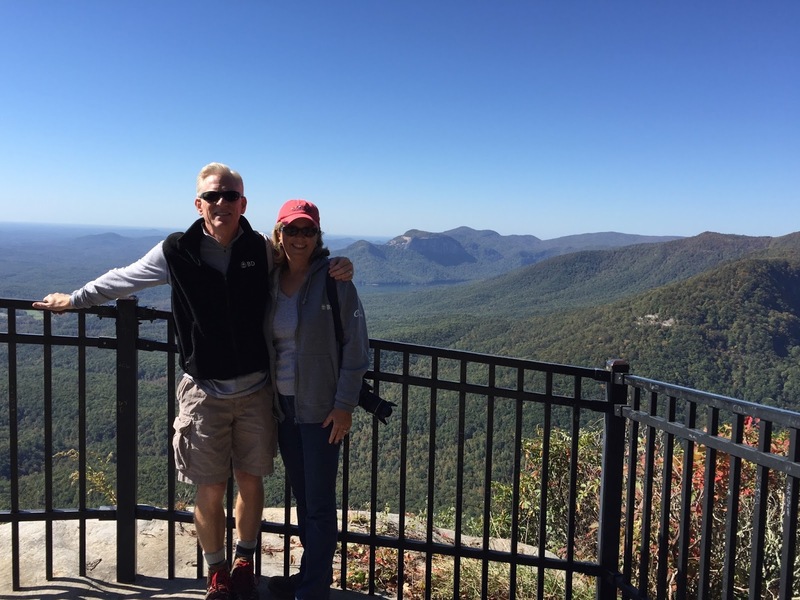 We stopped first at the Visitor Center at Caesar's Head State Park, and took in the magnificent view from the overlook there. Talk about green. That's Table Rock in the distance, and it's on our list too. As hubs says every time we see it in the distance, 'I've got to get over there. It looks high and dangerous.' And of course I say 'Me too. I love me some high danger.' Ha! We've had an abundance of rain in the Upstate this fall, so I don't think the colors are going to be as vibrant as they might be otherwise. I'd read in our handy hiking handbook that the hike to the falls was about 2 miles in and 2 miles out, and rated not strenuous, but that's if you take the guidebook with you and read the directions. We left the guidebook in the car, because it seemed simple enough...cross the road, hop on the trail, hike two miles in, see beautiful falls. There were a few problems with this plan. The short version is pretty much my modus operandi whenever I go hiking in the woods with hubs. I leave the car park feeling jubilant, energized, ready to take on the world. At some point we realize we're either a) not on the right trail or b) taking the long way round instead of the direct route we intended, and I end up on the verge of frustrated tears. Sometimes I might even fall right on over the verge. The gentleman at the visitor's center said yes, cross the road, hop on the trail to the left and follow it around. It will take about an hour. So that's what we did. Except we were first supposed to drive down the road another mile, park there, cross that road, and hop on that trail to the left. What's an extra four miles on a beautiful autumn afternoon? Well it might just be the thing that sends me over the verge. Also, it was steep aka strenuous. Whatever. I got over myself, we found the right entry point, and off we went feeling almost jubilant again. The trail was lovely and high and so serene. We were anxious to reach the falls because we'd read they're the most visited falls in the state of South Carolina. Hmmm....looks like police tape. Danger. Do Not Enter. Which is exactly what it was. Apparently there are a series of bridges you need to cross to get to the falls and with all the recent storms one of the bridges made the route impossible. Unless you want to hike an additional four hours around them, but do not attempt it without food, water, and plenty of daylight. He is seriously thinking about it y'all. We carried on anyway, along the un-waterfall trail, because we'd read there was an overlook that would allow you a glimpse of them. I'm zoomed in, and if you look hard you'll see there's a fabulous waterfall waaaaay across the valley. I read the falls plunge over four hundred feet, so we definitely didn't get to appreciate the full effect, and we'll want to come back another time. As hubs and I are standing alone on this wooden platform about three miles into the woods in the middle of nowhere admiring the far off falls, a group of seven or eight college boys hiked in. They were so polite, and really friendly, and we chatted for a bit. Turns out one of them went to high school with my brother-in-law's niece and nephew. Oh don't you just love this big small beautiful world? Beautiful pictures, beautiful day! So glad I clicked on your post from #FMF...I love fall too, everything about it. Blessings! Yes, I do love this beautiful world. Sorry you didn't get a better look at the falls, but it appears you saw a lot of beautiful scenery where you were. What a beautiful area. So glad you were able to hike but sorry you left the guide book in the car. Looks like a lovely wooded area and the trees are starting to change color. Have a nice weekend. Well, what fun and you now livei n such a beautiful part of the country to hike and enjoy the beauty of this great land. Happy weekend! Wow... awesome pictures. I bet that falls is absolutely breathtaking up close and personal. Especially this time of year when Mother Nature is wearing her October best :) You were good to stop at the police tape. Curiosity would have gotten the better of me and I would have wanted to see the bridge that was out just to see for myself that it was impassable. I felt like I was right there with you - thank you for the journey! I can see the falls, but look forward to a photo of them much closer! Such a beautiful place!! Thanks for always taking us along! I miss the beautiful colors of Fall as well as the beautiful scenery of East Tennessee. California just doesn't have the same Fall effect though there is some pretty cool scenery here. Nice photos to remind me of home. Your scenery is pretty much the same as my ol' Tennessee home.